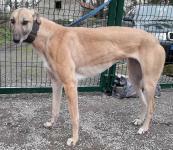 A very tolerant and placid 3 year old coursing girl, Dawn came to us on 15th Feb 2019. 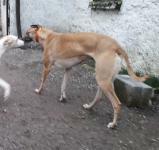 We will take better photos but for now here she is being inspected and welcomed by Lynne. 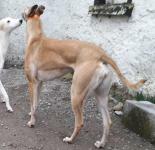 She has no injuries that we have been made aware of, however it does look like she is missing some cm from her tail, and she is fully vaccinated and wormed and carries her own passport too. 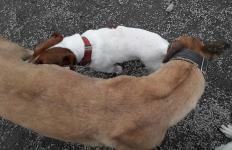 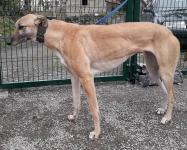 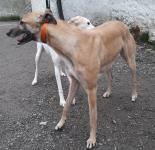 As you can see she is beautifully proportioned and in good condition.Small dog friendly but not tested with cats.